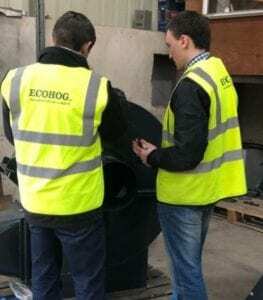 ECOHOG COLLABORATE WITH IT SLIGO TO DELIVER SIGNIFICANT IMPROVEMENTS THROUGH INTERTRADEIRELAND’S FUSION PROGRAMME. IT Sligo and Ecohog have secured funding through InterTradeIreland’s FUSION Programme to partially fund a graduate and academic supervisor. Over 12 months, the combined team will implement a process improvement programme and deliver significant savings for the company. Ecohog Ltd, based in Carrickmore, design innovative waste separation technology tailored for the Recycling industry. Graduate Chris McCann was hired as a production engineer to maximise productivity and cost efficiencies in the manufacturing process. The goal of the FUSION project is to carry out a detailed analysis of Ecohog’s current design and manufacturing processes, which will then be optimized using best practice in order to improve efficiency and minimize waste. The first pilot project will be monitored through to completion to prove the new process development. For more information on Ecohog’s products view the Ecohog product section. This entry was posted in Uncategorized and tagged ecohog, fusion programme, intertradeireland, IT Sligo, production engineer. Bookmark the permalink.